It has be reported yesterday that Nigerian Army and the Multinational Joint Task Force (MNJTF) are tightening the noose round the neck of Boko Haram in the Lake Chad area. The troops have blocked all supply routes to the insurgents in the build-up to the next stage of liberating the over 200 Chibok girls abducted two years ago by the terrorists. The blockade covers arms, ammunition and other logistics, highly placed sources told The Nation.The number of MNJTF troops deployed in the Lake Chad Basin by Nigeria, Cameroon, Chad and Niger Republic had hit 10,500 by yesterday. The MNJTF forces are receiving intelligence and reconnaissance assistance from France, Britain and the United States.Nigeria has already released $80miilion (N33.440billion) of the $100million it pledged to revitalize the MNJTF. A top military source confirmed last night that the blockade was part of the ongoing Operation Crackdown against the insurgents.But he explained that the troops could not move now into the targeted part of Sambisa Forest because of the rains.Sources said the marshy nature of the area makes movement difficult at this time of the year. One of the source said:“There is no doubt about the fact that we have blocked all supply routes of Boko Haram. These include supply of arms, ammunition and other logistics. If we don’t do so, we won’t have recorded the success at hand.“This is not just a Nigerian issue;we have been able to bring our neighbouring countries on board. We are all working collectively for peace in the Lake Chad Basin. “We now have about 10,500 troops in the MNJTF already deployed in Lake Chad Basin in order to make it a battle to the finish. The Federal Government has already released about $86million (N33.440bn at N418 to a US$) of the $100million it pledged to the MNJTF. The Secretary-General of the Lake Chad Basin Commission, Engineer Sanusi Imran Abdullahi, made the disclosure when the Chief of Army Staff, Lt. Gen. Tukur Yusuf Buaratai, visited him in N’djamena. The President had, in June 2015, approved the initial remittance of $21million. The sum went up to $86million by August 30 this year. 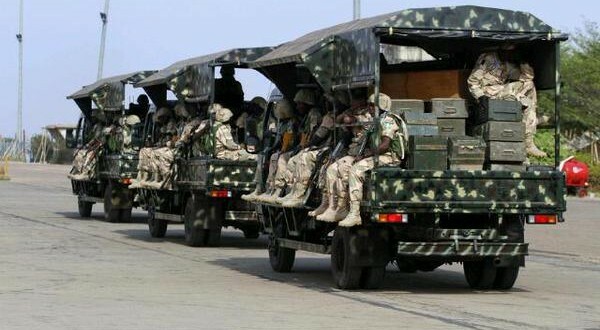 “This funding is part of what has helped the MNJTF to record a breakthrough against Boko Haram,” the source added. Buhari had, on January 28, in Addis Ababa made the disclosure at a high-level meeting of the African Union Peace and Security Council in Ethiopia. On the liberation of Chibok girls, the source claimed that a lot was being done by troops to locate and free them with other captives. “We are working very hard. We have been following every lead, including information that they are in Sambisa Forest. Due to rainy season, we cannot move in now because if you are on foot, you cannot move more than 20 metres before you get stuck. “Our troops have families too; they know what it takes to have these girls in captivity. We will do our best for these girls and will surmount all obstacles to set them free. That is why we are annoyed with those who have links with the insurgents. “As soon as we are in the dry season, we will move into the Sambisa Forest for a massive battle. As soon as it is accessible, we will go inside.